Blossom Tales is a top down action RPG made by indie studio Castle Pixel that successfully captures the essence of classic Zelda titles while avoiding the negative reality of being a mindless rip-off. While the game does borrow much from its predecessors, it does so in a tasteful fashion and even makes a concerted effort to adopt its own unique identity. Through its fun, witty writing and its grounded, sometimes challenging gameplay, Blossom Tales offers an adventure you honestly don’t want to miss out on. The game is told through a framed narrative as a grandfather sits down with his two grandchildren, Lily and Chrys, to tell them a fairy tale. As players control the game’s heroine through the setting of the grandfather’s fantasy story, their silly exchanges continually interject over the gameplay to offer humor and interesting context to the events in the narrative. While some players might consider their interrupting dialogue distracting, I found that the commentary struck the right tone and made me chuckle on more than one occasion. The framed narrative serves as more than just story presentation, however, as it also lends gameplay mechanics at times. At various points in the plot, the grandfather gives Lily and Chrys the ability to choose which enemy-type the heroine (appropriately named Lily) faces. It’s funny to watch the children debate which enemy it will be. To be clear, the choices do not add long-lasting meaningful changes to the story, but they do add flavor to your specific playthrough. The fact that these moments only happened a few times in the first half of my playthrough and did not re-occur for the duration of the game was a bit disappointing. Instead of feeling like a staple mechanic, it feels more like an interesting idea that wasn’t implemented all the way. I’m in no way advocating this choice system should have taken over and been used in every single encounter, but I would like to have seen two or three instances of it later on to balance the mechanic throughout the game. 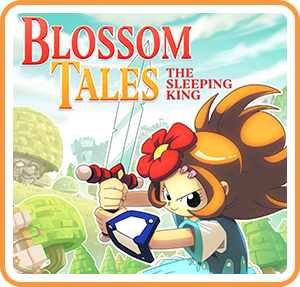 The actual plot of Blossom Tales is simple enough: an evil wizard tries to take over the kingdom of Blossom by forcing its king into a magic slumber. Our heroine, Lily, is the only one who can save him, and so she sets out on an adventure to do just that. The fact that the plot generally lacks complexity is not an issue here as that’s not what the game is about in the first place. On the same token, the story doesn’t hold the game back in any way. It’s just what it needs to be, pushing you to the next region of the world, to the next dungeon, to your next challenge. And it succeeds in doing that, all the while providing players with interesting worldbuilding and lore tidbits. Don’t let the lack of heavy plot fool you: there are layers of a living, breathing world with a history told through items, NPCs, and locations. You just have to go out and find it. Speaking of the world, since the game doesn’t feature a groundbreaking plot, it’s important for the actual setting to be fun – and it is. It boasts several very distinct regions undoubtedly familiar to gamers: an earthy/forest region, a snow region, a swamp area, and a dark/twisted area. Each region contains its own feel and secrets as well as its own enemy types. I never felt bored moving through them as the pace of the story pushes you along at a reasonable rate, giving you a variety of things to look at. 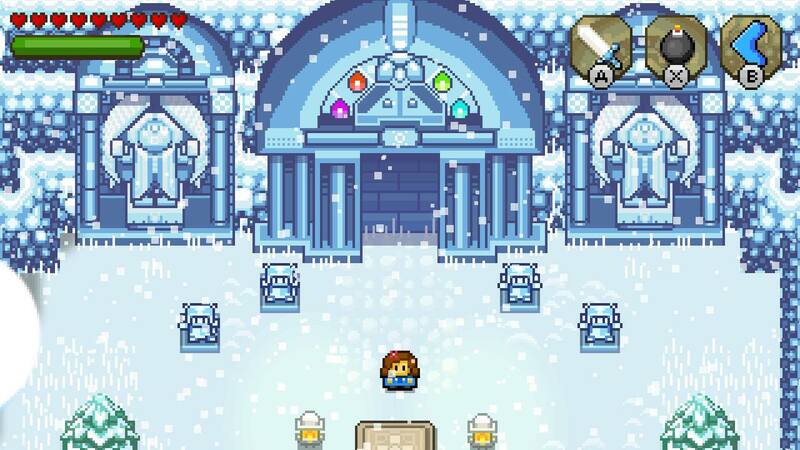 The story’s purpose for visiting these regions is the dungeons they contain, with each dungeon representing a specific element – earth, ice, and fire. Each dungeon feels very different from the others, providing its own set of challenges, puzzles, enemies, bosses, and traps. I never fatigued of asset reuse, and I never complained about having to do another one. As there are only three main dungeons for the core of the game and one final dungeon at the end, if anything I wanted more of them. At times, they prove difficult, but that easily could be because I’m just terrible at puzzles. The layouts and designs are fun and just confusing enough at points that they feel mysterious without feeling overwhelming. Between the puzzles and enemies, there is always something to do that contributes toward completing it, meaning nothing ever feels trivial. 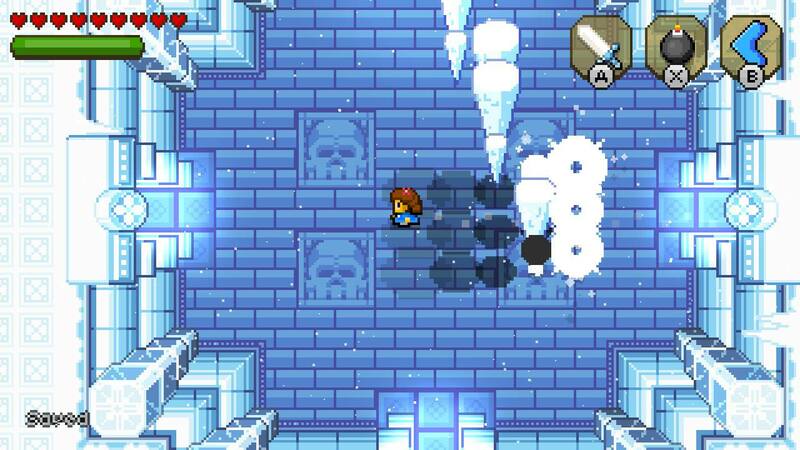 I was always clearing enemies to make the puzzles easier, or killing them to reveal chests containing important keys. 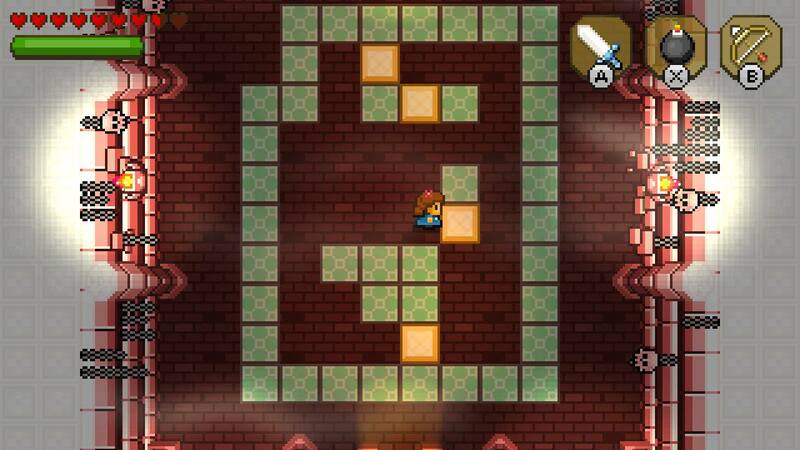 Or I was spending my time traversing puzzles to open new paths. Everything has a purpose, and it feels rewarding. Part of why the paths and puzzles feel rewarding is because they are actually challenging. While I’m not the greatest at puzzles anyway (and there are quite the variety of them in this game), I truly believe some of them are just naturally difficult. However, their difficulty never made me feel like I couldn’t complete them. They aren’t simply hard to make the player feel stupid; quite the opposite. Their difficulty feels like encouragement that you can master it, I can get better. And truthfully, I did over time get better at the various tasks. What feels almost impossible in the beginning of the game feels second nature as the adventure wears on. The puzzles in the dungeons become progressively more complex, taking mechanics introduced early and adapting them to make for deeper challenge. When I say I never felt stupid, that isn’t to say I never got frustrated because I did. I got very frustrated at times, huffing in agony when my reflexes weren’t quick enough to dodge a magic flame while tightroping across disappearing platforms. Or when my bad memory couldn’t keep up with the singing stone patterns (curse you, Castle Pixel). Or when I slid a stone the wrong way, forcing me to start over on entire puzzles. There are definitely frustrating times to be had throughout, but it’s only frustrating enough to make the victory all the more sweet. Every single time I got past a puzzle, I felt accomplished and I felt good about myself. At the end of the day, the mark of successful difficulty balance is when a game can make you feel good about yourself for completing its challenge. 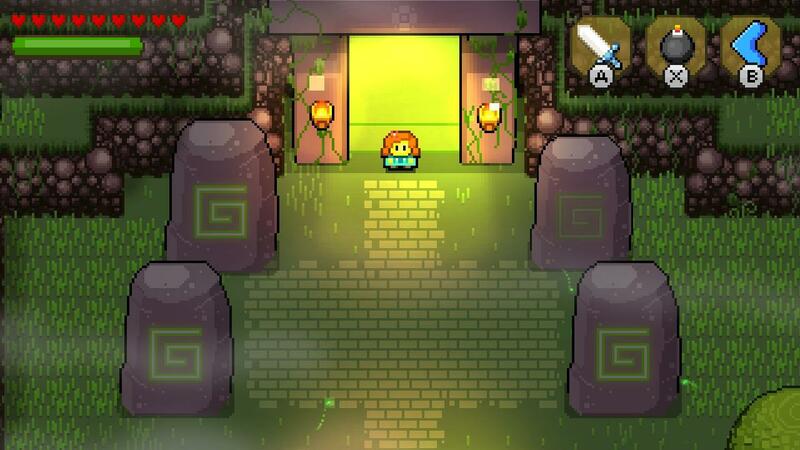 Speaking of fun challenge, the combat in Blossom Tales as a whole is both fun and challenging. While simple in concept, the game provides you with different tools (although very very familiar tools) to help with your enemy slaying that flesh out both strategy and flavor. Each weapon brings a different skill to the table. Whether it’s the bomb to take out larger enemies or the boomerang to take out multiple smaller baddies, there’s a use for each one. The combat system truly feels like something I could master, not just be average at. Over time, I could get quicker at switching to various tools for different situations, I could get better at blocking with the shield, I could get used to throwing the boomerang to slay several distant enemies while taking care of closer ones until it circled back. While some players might be able to get by just swinging the sword to win, others will be able to blaze through encounters like an epic warrior by using all the tools available to them. There’s a learning curve, and one that rewards players for taking the time to master it. When not slaying bads and diving through dungeons, the game encourages you to explore its various areas around the map. I already spoke of its general variety from area to area, but the contents within those boundaries are as packed with things to do as they are different from one another. Much like with the puzzles, each activity or secret rewards you for finding and completing it. There are races, collectables, hidden caves, items in the grass, and more. Since the overworld map stays bare throughout your travels, it’s up to you to search out these nooks and crannies to find the hidden gems. In the end, there is hours of exploration to be had, and I haven’t even done it all yet. The game allows you to enter the world again after you beat it, announcing that Lily’s tasks are not over, so I know there is so much more exploration for me to do. 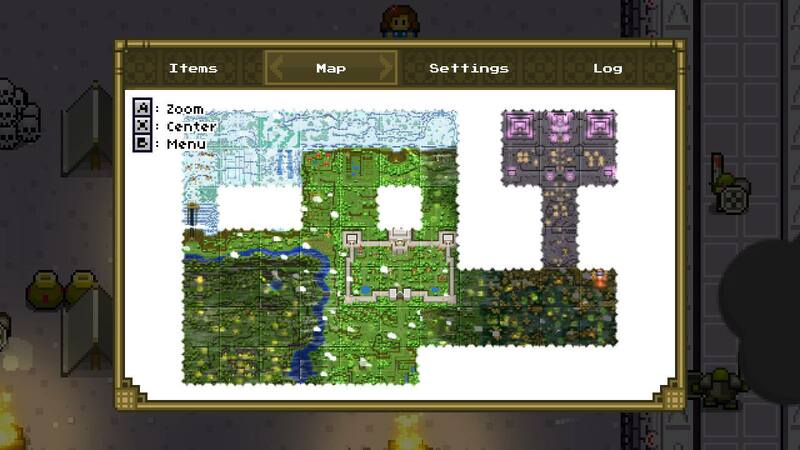 There were even parts of the map that I never entered for story purposes, so the game wants you to go off the beaten path and makes it worth your while when you do (that’s if you take a break from cutting down grass long enough to stray from that path). My ultimate feeling concerning the exploration in Blossom Tales is that I’m positive I missed a lot of it on my first playthrough, and that’s actually a wonderful thing. It means I just have to jump back in and actually play some more – what a tragedy. As far as the general presentation of the game goes, it’s nearly flawless in my mind. I’ve spoken to a few people who drew issue with how some of the pixelation is presented, but that did not enter my radar personally. For visuals, I really enjoyed how vibrant the world is. As I mentioned earlier, each area feels distinct, and much of that is due to the variety and range of color, avoiding what is an issue for some indie titles suffering from bland coloring and appearing held captive by a single mood or desired tone. The soundtrack and general sound design complements the visual aesthetic perfectly. From the moment I hit the title screen, I knew the music was going to be right up my alley, and goodness, the journey was a pleasant one. From soft and tender tracks fitting of the young protagonist to larger than life fanfares echoing the scale of the adventure as a whole, the music checks all of the boxes it needs to for this game to sit right up there with its classic inspirations. Each area’s personality exudes through its musical track every bit as much as through its distinctive look. At times, I just let the game sit to allow the music to play in my headphones (but the album is on Spotify, guys, so really, you don’t have to do that). At the same time, the music is partnered with excellent overall sound design. Every sound effect for combat or running or cutting the grass or breaking crates just fits. It’s hard to accurately explain how good sound design works. It’s like you hear when it’s really off, and you just know when it’s really on. Here, it’s really on. In the end, all the different aspects of Blossom Tales combine to make an incredibly solid game that offers at least a dozen hours of interesting story and fun exploration. From the mechanics to the visual and audio presentation, everything feels extremely polished and reflects a game that knows exactly what it is and knows how to be itself really well. Packing a challenge that’s just as fun as it is difficult, this is a game that almost anyone will find something to like about it, whether it’s the nostalgia, the puzzling dungeons, the rewarding exploration, or the addictive grass-cutting. 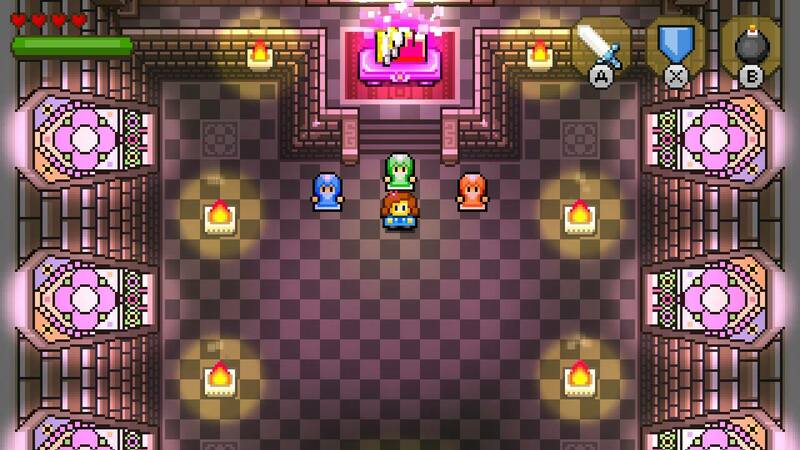 I don’t just love Blossom Tales for taking me back to classic Zelda; I appreciate it for bringing classic Zelda to me in a modern way with enough heart and identity to stand on its own.